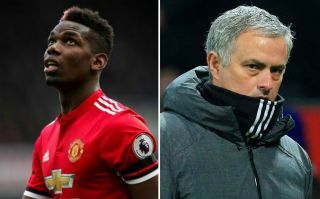 Manchester United manager Jose Mourinho is reportedly keen to seal the transfer of a surprise Premier League midfielder to replace Paul Pogba. That player is Arsenal’s Aaron Ramsey, according to the Daily Star, with Chelsea also said to be monitoring the Wales international’s situation at the Emirates Stadium. While Ramsey has not been at his best for Arsenal for some time, the Daily Star claim Mourinho is tempted to snap him up as he seeks to improve his midfield options, with Pogba’s future at Old Trafford also possibly in doubt. The 27-year-old would be out of contract at the end of next season so could be available on the cheap this summer in theory, though Arsenal are unlikely to want to sell a key player to a major rival again. The Gunners saw Alexis Sanchez leave them for United in January, with the Chile international following in the footsteps of Robin van Persie a few years ago. Ramsey might not be as important to Arsene Wenger’s side, but he remains a quality performer on his day and looks the ideal box-to-box player for Mourinho’s system. In a potential double raid on Arsenal, the Daily Mirror have also linked defender Hector Bellerin as a transfer target for the Red Devils.